The 2019 NFL Draft will kick off on April 25 in Nashville, Tennessee, and the Vikings are currently slated to make the 18th overall pick. Defensive tackle has been held up as this draft’s strong suit, and for good reason – the position could produce as many as seven or eight of the top 50 players selected in this year’s draft. … Teams that haven't addressed DT by Friday of draft weekend could be left in a lurch, as there isn't as much depth in the middle to late rounds. In looking at offensive tackle prospects, Zierlein said that “it won’t receive as much mention, but this year’s group of tackles offers a greater selection of starters and potential starters than we’ve seen since 2015. Jawaan Taylor and Andre Dillard will definitely go early, while Dalton Risner, Kaleb McGary and Greg Little all have a shot at going inside the top 40. Max Scharping and Tytus Howard are future starters at right and left tackle, respectively, while guys like Dennis Daley and Yodny Cajuste highlight a group of prospects offering good mid-round value. Ranked fifth on Zierlein’s list was tight end, a position group most feel will be led by Iowa standouts T.J. Hockenson and Noah Fant. D.K. Metcalf, Parris Campbell and Miles Boykin have rare traits but require projection over tape. Hakeem Butler is big and physical, but he has loads of drops. Guys like Deebo Samuel, A.J. Brown and Marquise Brown add stability. This is a markedly better and deeper group than last year’s class. Zierlein then listed safety, quarterback, running back, cornerback and wrapped up his rankings with linebacker. I wouldn’t call this a “bad linebacker draft,” but it definitely thins out earlier than many teams would probably like. Devin White and Devin Bush are legitimate first-round talents, but Mack Wilson may be the only true second-round candidate, while a relatively small group of linebackers could fill out Rounds 3 and 4. There is decent backup/special teams depth available on Day 3. 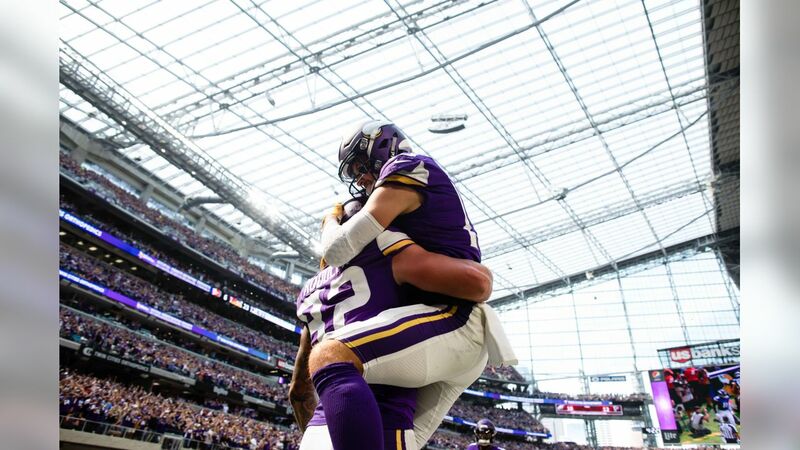 View the best 30 Vikings celebration photos caught on camera from the 2018 season. As NFL executives, scouts and coaches prepare for the NFL Draft, fans of the game likely will wait a few more months before gathering for their own fantasy football drafts. Halfway through the 2018 season, Thielen was setting up for some records. He was on pace to have the second-most PPR points in a season ever (behind Jerry Rice’s 1995), and it would be a close second. He looked unstoppable. Things cooled over the back half, and Thielen fell more than 100 points shy of Rice and finished as only the WR7, but still, he was one of the league’s top receivers. For a team that didn’t have a single top-25 fantasy receiver from 2012 to 2016 (the only team in the league that can say that), the development of Thielen and Stefon Diggs is definitely a big positive. The other two players on Kelly’s list were running back Adrian Peterson, who rushed for 2,097 yards on 348 carries in 2012, and quarterback Brett Favre, who signed with the Vikings in 2009 and that season racked up 4,202 passing yards and 33 touchdowns. Favre had more passing yards in 1995 and had more touchdowns in 1995, 1996 and 1997, but you could argue his 2009 was his most impressive season, especially considering he turned 40 in the middle of it. He set a career-high in passer rating (107.2 — surely in part a function of the changing league) and a career-low in interceptions (if you except a four-attempt rookie season in 1991) in leading the Vikings to a 12-4 finish and a crushing playoff loss. Kirk Cousins’ debut season in Minnesota came close to Favre’s 2009, but for now [Favre] reigns supreme.